The problems between the Formula 1 teams and the race organizers had resulted in Team Lotus withdrawing from the Monaco GP and there were further political problems before the Belgian GP a fortnight later because the Belgians decided that they would only pay appearance money to the six big teams. This left 10 other fighting over four places on the grid and they decided not to take part in practice on Friday as a protest. A compromise was eventually organized and 20 cars took part in qualifying on Saturday. Graham Hill took pole in his BRM with Jim Clark's Lotus and his BRM team mate Jackie Stewart alongside him on the front row. Ritchie Ginther put his Honda alongside Dan Gurney's Brabham on the second row while World Champion John Surtees was back on the third row with Rob Walker's drivers Jo Bonnier and Jo Siffert. It was raining on Sunday and at the start Hill took the lead from Clark but the Lotus moved ahead on the run down to the Masta Kink and soon pulled away. Hill was struggling with the BRM in the wet and Stewart soon moved up to second place while Surtees also overtook Hill only to suffer an engine failure. 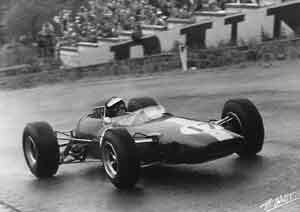 Hill eventually came under attack from Bruce McLaren's Cooper and on lap 18 the New Zealander moved up the third. In the closing laps Hill would also fall victim to Jack Brabham. Ginther finished sixth in the Honda while Richard Attwood (Reg Parnell Racing Lotus) looked to be on course for seventh when he spun into a telegraph pole. He was not seriously injured but the burst into flames and was badly damaged.